Wait Actions pauses the Task for the specified amount of time. After the expiration of the delay, Task is automatically continued. The delay can be useful in situations where Task has to wait for some other system processes to complete. 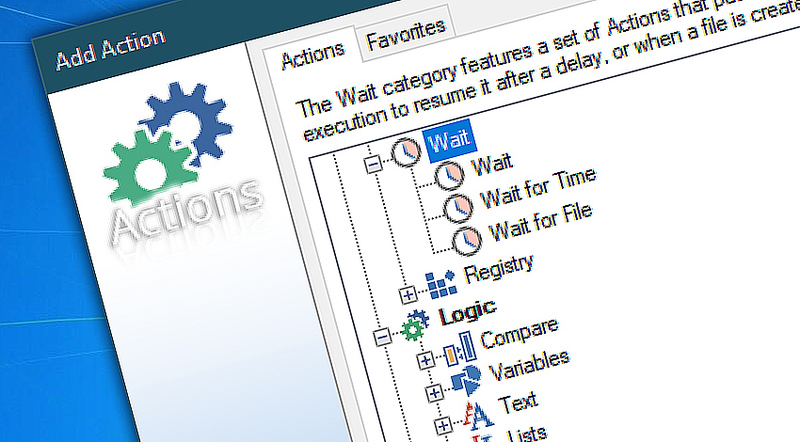 Wait is a simple and effective tool for setting up delays in automated Tasks. Just specify the amount of time to expire before the Task continues with following Actions. The Wait feature is especially useful when the Task initiates a parallel process and needs to allocate time for its completion. Wait for time pauses a Task until the specified time on the same day or another day of the week. Wait for file pauses the Task until a specified file is created, deleted, becomes accessible or inaccessible. Wait · delays automated Task for some time. Wait for time · pauses the Task until the specified time. Wait for file · pauses the Task until a specified file criteria matches.